WordPress is getting ready to release one of its largest updates. Don’t let it catch you by surprise! The biggest buzz for WordPress 5.0 is the new editor, they will be doing away with the what you see is what you get (WYSIWYG) editor and moving to a new block-based editor. It will have blocks for the format. So, you will break your editing into different sections or blocks, one for the headline and another for the main text content and others for images and so on. This may make it a little difficult for older WordPress themed website to upgrade. And things may not layout properly after the update is applied. Plugin compatibility may be an issue and most likely specialized code scripts will need to be closely checked. This update will affect many WordPress websites and keep web developers busy. Website owners need to be aware and plan for this update it’s most likely going to cause issues for many websites across the board. You may not want to be the first to update your website but it’s going to happen, and you should plan for it. Remember, it’s not just the editor that’s changing, plenty of security issues will be updated and you will be leaving your site open for hackers. Hosting providers will be keeping a close eye on the security issues and will be warning and encouraging customers to make the move for the security reasons. 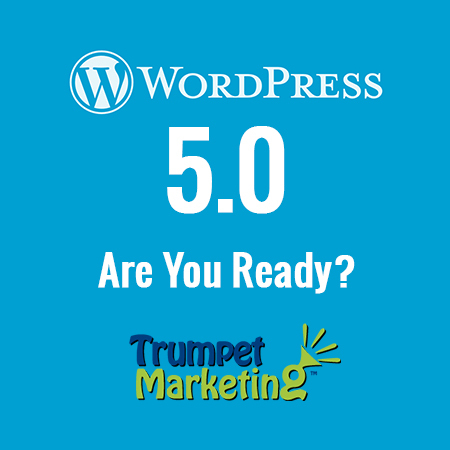 We expect bumps along the way and only time will tell how the jump to WordPress 5.0 will go. If you have a WordPress website and need help we would love the opportunity to chat with you about your ideas and plans. Just give us a call! (301) 515-4184 or email us at info@trumpetmarketing.net .